It happened in the city Klimontów on the 27th day of November 1835 at 9 a.m. Appeared orthodox jew Icek Bursztyn, teacher***, 55 years old and Jakub Frocht, baker 55 years old, both living in Klimontów and they informed that on the 26th day of November of the current year at 11 p.m. died Mosia Ferber, living in Klimontów, 72 years old, daughter of Herszel and Zysla, late spouses Ferber. She lef two sons: Berek Feber and Zysel Konixberg?, both of age. This act was read aloud to the declarants, deceased's friends and signed by them. It happened in the city Klimontów on the 7th/19th day of November 1839 at 8 p.m. Appeared orthodox jew Berek Ferber, capmaker, 30 years old, living in Klimontów in the presence of the witnesses: orthodox jew Icek Bursztyn, teacher, 59 years old and Jakub Frocht, baker, 58 years old, both living in Klimontów and presented Us a female child born in Klimontów on the 31st day of October/12th day of November of the current year at 8 p.m. with his legal wife Małka Forber nee Borkowicz., 36 years old. The child was given the name Mosia Ferber. This act was read aloud to the declarant and witnesses and signed by the witnesses and child's father. It happened in the city Klimontów on the 25th day of April/7th day of May 1846 at 3 p.m. Appeared orthodox jew Berek Ferber, capmaker, 40 years old, living in the city Klimontów at the house number 93 in the presence of the witnesses: orthodox jew Chaskiel Bursztyn, teacher, 35 years old and Zelik Ferber, capmaker, 46 years old, both living in the city Klimontów and presented us a male child born in the city Klimontów on the 17th/29th day of April of the current year at 3 a.m. with his wife Małka nee Kienigxberg, 44 years old. At the religious rite of circumcision the child was given the name Feszel. This act was read aloud to the declarant and witnesses and signed by them. It happened in the city Bogoria on the 8th/20th day of August 1848 at 5 p.m. Appeared orthodox jew Herszla Goldwaser, trader, 67 years old, living in Bogoria and Josek Kaperberg, weaver, 48 years old living in Bogoria and they informed that on the 5th/17th day of August of the current year at 5 a.m. died in the village Pęcławice Zelik Royzengart, 7 years old. He left his late parents: Szaja and Pesla Royzengart who lived in the village Pęcławice, laborers. After eye belief about Zelik Royzengart death this act was read to the declarants and signed by them, first is deceased's relative and second is deceased's acquaintance. 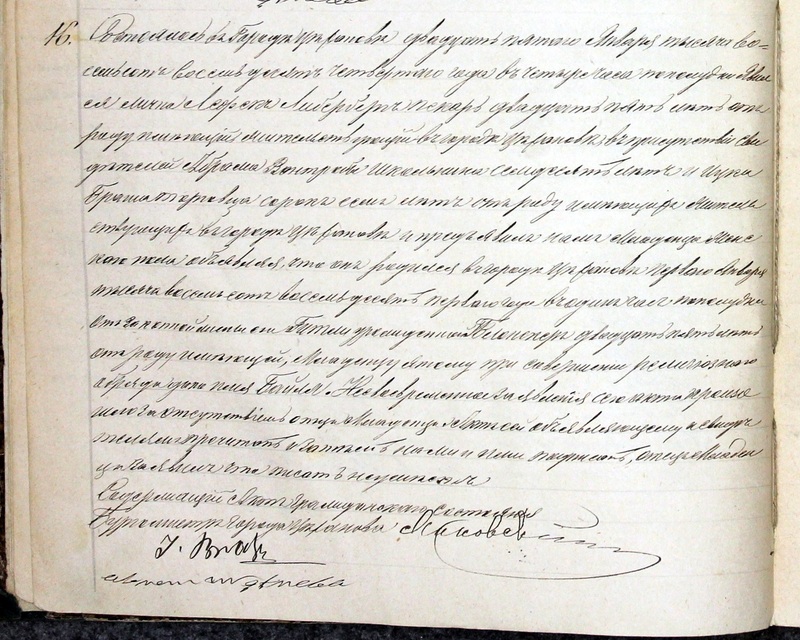 It happened in the city Klimontów on the 9th/21st day of May 1861 at 9 a.m.
and that this marriage was preceded by 3 banns announced in Klimontów synagogue during the mass on the: 4th, 11th and 18th days of May of the current year. Spouses are not related to each other. Newlyweds didnt make premarital agreement. 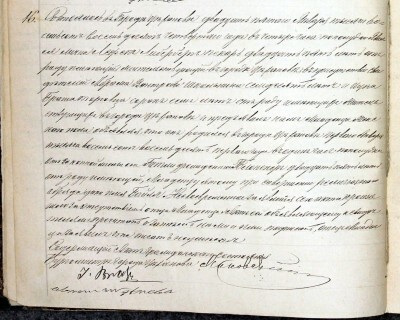 Bride's brother, Izrael Rozengart gave oral permission for this marriage. This act was read aloud to the present and signed by them. 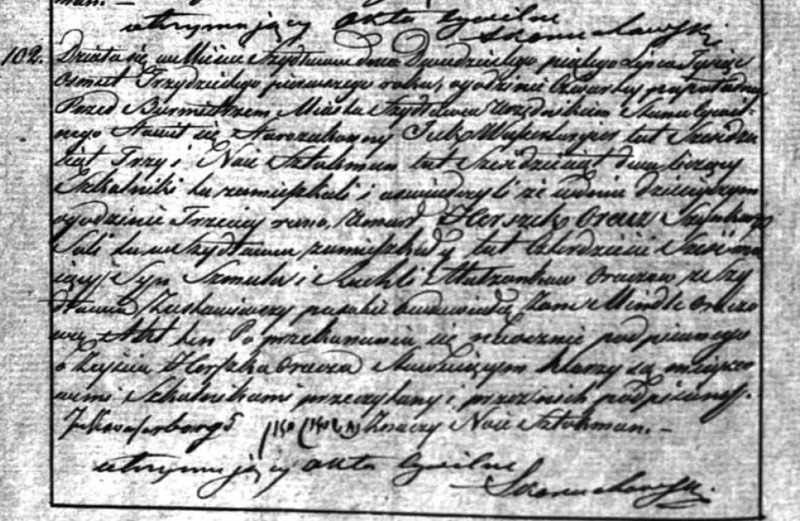 Could someone help with translating the attached birth record (taken from Varniai Lithuania parish records ~1841). It happened on the 15th day of December 1773 in Varniai romancatholic parish church. A child was baptised by the local priest with Holy Water and Holy Oils and was given the name Jakub. parents: urodzeni* Franciszek and Magdalena nee Filipowicz, legal spouses Giedwiłło. Son was born on the 15th day of December 1773, born in Varniai parish. Godparents: Benedykt Urban with Mieceniekowani???? thanks alot!!! was Ferber her maiden surname as well as the surname of her husband? was she a widow or no mention of that? this is literal translation, word for word. there is no info about her maiden name and no info about her civil status but there is info that she left her two sons so i think her husband was already deceased becuase he would be mentioned otherwise. Only her sons are mentioned. 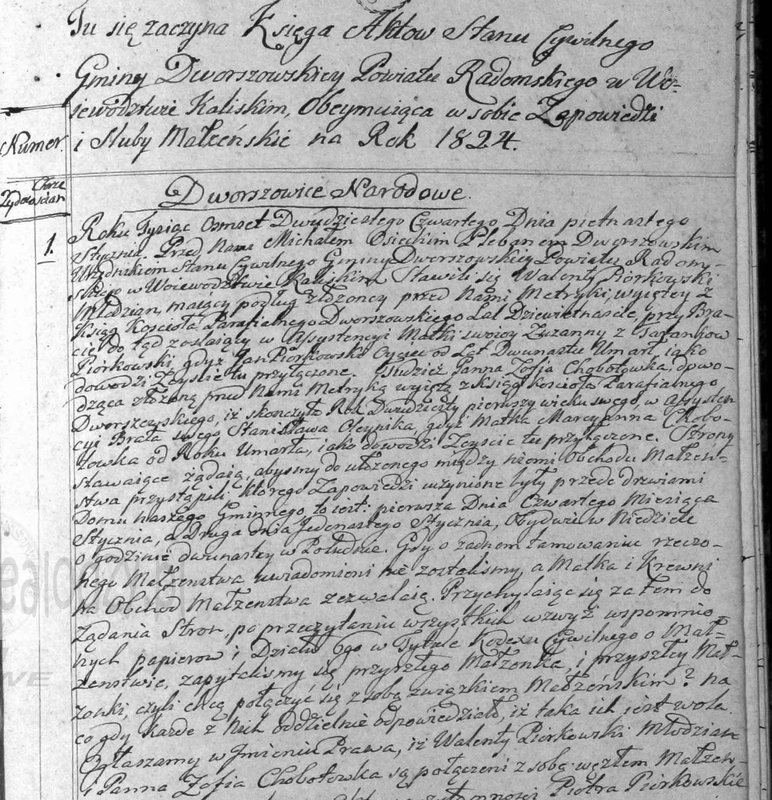 I'd be very grateful for a translation of the basic details of this birth record of Bajla Liberberg. It happened in the city Ciechanów on the 25th day of January 1884 at 4 p.m. Appeared in person Lefek Liberberg, baker, 25 years old, living in the city Ciechanów in the presence of the witnesses Abram Wątroba, teacher, 70 years old and Icek Brasz, trader, 47 years old, both living in the city Ciechanów and presented us a female child informing that the child was born in the city Ciechanów on the 1st day of January 1881 at 1 p.m. with his legal wife Gitla nee Płoneker?? ?, 25 years old. At the religious rite the child was given the name Bajla. this act was delayed due to the fathers absence. this act was read aloud to the declarant and witnesses and signed by us and them, child's father informed he is illiterate. 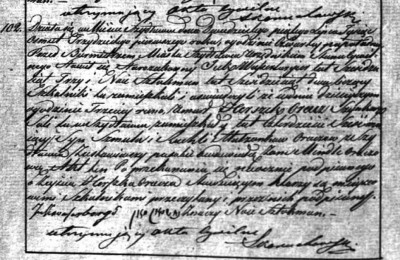 Hi, I would appreciate a translation of the attached marriage document for Zofia Chobot. Thank you. It happened in the city Szydłowiec on the 25th day of July 1831 at 4 p.m. In front of the mayor of the city Szydłowiec, serving as Civil Registrar appeared orthodox jew Icek Wuszerborgier, 63 years old and Nail? Sztokman, 62 years old, teachers living in Szydłowiec and they informed that today at 3 a.m. died Herszek Oracz, salt trader, living in Szydłowiec, 46 years old, son of Szmul and Ruchla, spouses Oracz from Szydłowiec. He left his wife Mindla Oracz. After eye belief about Herszek Oracz death this act was read aloud to the declarants who are local teachers and signed by them. 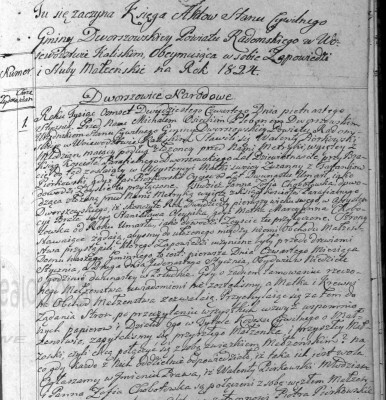 Zofia Chobotowska, according to the birth certificate extracted from the Dworszowice church baptism book 21 years old, in the presence of her brother Stanisław Olejnik. Her mother, Marcjanna Chobotowska died 1 year ago, according to the attached death certificate. both on Sundays at noon. We were not informed about any objections to said marriage. Mother and relatives allowed for this marriage. Piotr Piórkowski, brother, 36 years old and Wawrzyniec Taranek, 38 years old, uncle's son and Grzegorz Czajkowski, bride's godfather, 55 years old and Stanisław Olejnik, bride's cousin, 36 years old, all farmers living in the village Dworszowice Narodowe on the farm. this act was read aloud to the present and signed only by Us because the others cannot write. 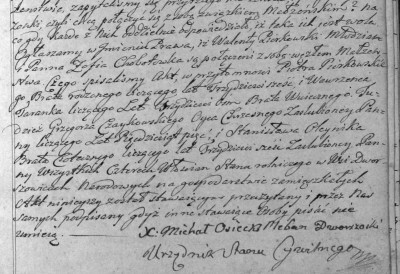 priest Michał Osiecki signature, Dworszowice parish parson, serving as civil registrar. 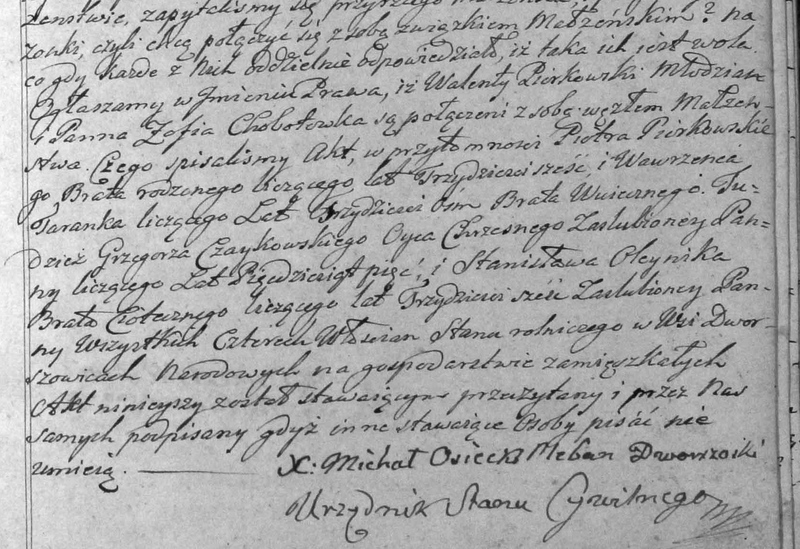 This is a birth record of the Podjazd family from Mlawa. Would love to get a translation! 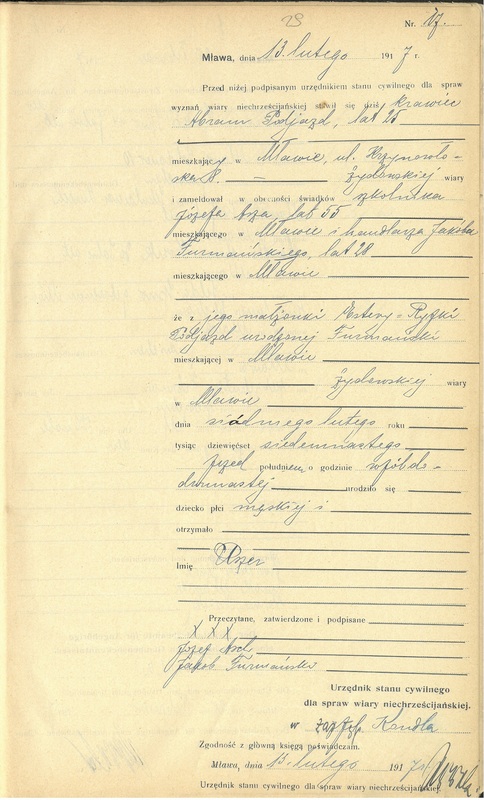 In front uf undersigned nonchristian confessions civil registrar appeared today: tailor, Abram Podjazd, 25 years old, living in Mława at Krzynowsłoska 8 street, jewish confession and he reported in the presence of the witnesses: teacher Józef Arz, 55 years old, living in Mława and Jakub Furmański, trader, 28 years old, living in Mława that a male child od jewish confession was born with his wife Estera Ryfka Podjazd nee Furmańska living in Mława on the 7th day of February 1917 at 11.30 a.m. and was given the name Uszer??? 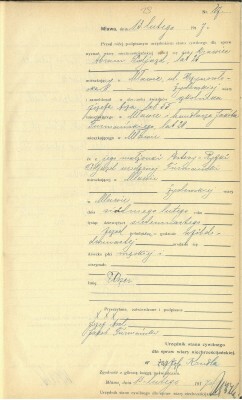 Mława, 13th day of February 1917, offcial signature.